Reliable and fast, the MICROLINE 320 Turbo Dot Matrix Printer from OKI uses a 9-pin dot matrix system to produce up to 435 characters each second in a SuperSpeed Draft mode. It also uses zero-tear and auto-park technology to eliminate waste by ensuring paper is fed properly through the rear push standard tractor at a rate of 5" per second. Copies are possible as well with the ability to produce an original plus up to 5 interleaf or carbonless copies. Working with computers is not an issue with both USB and IEEE parallel connectivity options and emulations for Epson, IBM, ANSI, and OKI languages. The printer can also use paper up to 17 mil thick and has an impressive monthly duty cycle of 20,000 pages. 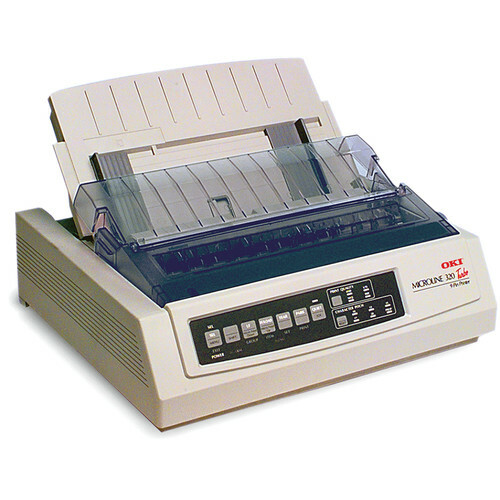 Box Dimensions (LxWxH) 21.3 x 20.4 x 9.5"
MICROLINE 320 Turbo Dot Matrix Printer is rated 5.0 out of 5 by 1.
what is the ribbon needed? will this printer work with windows 7? It is Windows 7 compatible.